Recently, I’ve started writing monthly reports for my full training clients. Many of them don’t get to see their horses work much, so to keep in touch with their training, they’d text me for updates and I found myself texting back only short and incomplete answers. Hence, I set aside some time in the beginning of each month to write a comprehensive summary of what their horse was learning. Texts are still welcome, but generally people now have a much better idea of what’s going on. Writing the reports have proven just as useful to me, as they force me to evaluate and re-evaluate each horse’s personal journey and give reasons for what I’m doing. Not only does it keep me on my toes, it makes me think about what I’m doing instead of running on intuition. Intuition isn’t a bad thing, but it sure makes it difficult to hand the knowledge over to others when all you can really say is “do what feels right” to a person who hasn’t developed the feel just yet. One interesting thing I found was that most horses have a default. I guess that should be obvious, but it wasn’t, to me. They all have a certain way that they tend to respond to stimuli, and that “default” in large part determines the horse’s trainability. In general, I’ve found that most horses respond in one of four different ways. Reactive: When a horse reacts, he flinches away from a stimulus with a swift, jerky movement. For example, on the lunge, he will scoot forward when you pick up the whip. A reactive horse is usually motivated by fear. The horse whose default is to be reactive, is generally a flinchy, hot and spooky sort. Resistant: When a horse resists, he fights against a stimulus. For example, on the lunge, he will kick out when you pick up the whip. A resistant horse is often motivated by pain or desire to be dominant. The horse whose default is to be resistant is sulky, grumpy, and habitually has his ears pinned back. Responsive: When a horse responds, he moves away smoothly from a stimulus. For example, on the lunge, he will move calmly forward when you pick up the whip. A responsive horse is generally motivated by willingness to please. The horse whose default is to be responsive is generally pleasant and comes across quite sensitive. Unresponsive: When a horse fails to respond, he ignores a stimulus. For example, on the lunge, he will stand there when you pick up the whip. An unresponsive horse is generally motivated by laziness or boredom. The horse whose default is to be unresponsive will be dead quiet, patient, and stoic, and can sometimes give the impression of not being “all there”. but still *are* all there – you just have to dig deeper, right, Z? Horses also have a sort of “volume”. Not all reactive horses will necessary scoot forward when you pick up the whip. Some will merely step out more briskly than anticipated; others will panic and plunge through the fence. The vast majority of resistant horses never kick out or buck; they just pin their ears. This is why so many back pain and saddle fit issues go unnoticed. Just because a horse is easy to handle doesn’t mean its default is good, it just means its volume’s been turned down, and that can be a good thing – or a bad thing. One would also think, looking at the list, that all horses should be responsive by default. That’s not true. Remember that horses tend to react to all outside stimuli according to their default – not just aids. Sure you want a horse to respond to your aids, but you don’t want him to respond to a dressage letter, not even if that just means quietly moving away from it. The best horses are a trained balance between responsive and unresponsive, leaning one way or another according to their job. Arwen is more towards the responsive because she’s an adult’s dressage horse who needs to deal with complicated sets of aids in rapid succession. Bruno was far more towards the unresponsive side, because he had to ignore all spooky objects in favour of keeping a kid safe. Reactive and resistant horses, however, are almost always unhappy; it’s easy to see why – one is motivated by fear or pain, and the other is motivated by pain or by being in the wrong place in their hierarchy. We all know how gross it feels to be in a place where you don’t belong, even if you put yourself there. All these types of horses (although many horses don’t fit in any of the boxes) need to be approached differently. That’s the most important part of listening, after all: actually acting on what you’ve been told. Here’s a few little case studies. Magic‘s default used to be reactive. He feels things deeply, and he expresses them dramatically. Pushing his limits never, ever works – it just makes him go up like a mushroom cloud. Patience and understanding are absolutely key to keeping him happy. The upside of being reactive is that it’s a small – difficult and key, but small – change to becoming responsive, which he has become by a massive effort. Jamaica used to be excessively unresponsive – to the point where it became complete disobedience and quite dangerous. His automatic reaction was just to hang on your hands till Kingdom come no matter what you did to him. You could flap, you could kick, you could do whatever you pleased – he’d just plough onwards. Unresponsive horses can be very rewarding because they’re fairly easy and safe to train out of it, and then you can really fine-tune the level of responsive you want. Jamaica proved to be one of those. He still has unresponsive moments, but he’s starting to decide that moving away from pressure is generally a good idea. On the plus side, he’s by default not spooky, and because I never trained him to respond to anything except my aids, he remains non-spooky. Unresponsive horses can be really, really hard to get a read on. Some unresponsive horses have shut down, like a dog that just takes the kick because he knows it’s coming anyway. They bear pain and ill-treatment because it’s the only way they know how to cope. They can hide a tremendous amount of pain. Mercifully, most unresponsive horses are just really chill dudes at heart, who like to roll with it because that’s the way they are. Bruno comes to mind. Destiny is the most resistant horse I’ve ever met, and his volume was turned all the way up to the top. He wouldn’t just kick out at the lunging whip, he’d spin around and fly backwards, double-barreling at head height all the way and bringing to mind the legend that the Lipizzaners’ capriole was developed to decapitate footsoldiers. I sure thought he was going to decapitate me. Resistant horses, although a battle, are still an easier fix than reactive horses. Even though this chap’s problem wasn’t pain (which resistant horses almost always are in), he was more easily fixable than you would believe if you’d seen him at the height of his issues. Unfortunately, they’re not a pleasant fix in any way. There’s really two main ways to respond to resistance; to remove the stimulus so that they have nothing left to resist against, thus taking them by surprise and often removing the bitterness from the situation, or to resist their resistance more strenuously than they can resist you. When it comes to head-height double-barreling, option (b) is the only option that will leave you with your head still on. Removing the stimulus and rewarding aggression is a recipe from disaster. Hence, Destiny got a hiding. A big hiding. Now, his default is still to be resistant, but in the matter of a month we’ve got the volume turned down from enormous violence to merely pinning the ears. It’s not as good as resetting the default, but it’s a big step in the right direction. As for responsive, there’s not a lot of horses that are this way after people are done with them. A surprising number of horses are naturally responsive – they just get made either reactive or resistant, because the best horses are always the easiest to ruin. I love me a responsive horse. Nell was one of them, and we all know that she was just epic. The most responsive horse I have right now is undoubtedly Faith. I never had to teach her to move away from pressure because she had it programmed into her DNA. Once she knows how to move away from the pressure, she just does it without any fuss. She can come across spooky because she’ll move away (not leap away) from a scary thing, but personally, I don’t mind those. Nell was the same and as soon as you’ve got the whole moving-away-from-the-leg thing programmed they respond to your leg instead of the scary thing and do what you wanted. (Assuming you made yourself more important and valuable in their lives than scary things). Responsive + willing + gentle + intelligent = most trainable thing you’ll ever clap eyes on. Now for the million-dollar question, of course. What was the natural default of the majestic, legendary dragonbeast herself? I bet you’ll all be shocked to discover that Arwen was naturally unresponsive. Yep, you read that right. The dragon was the most unresponsive horse you’ve ever seen, and she still has that tendency lurking inside her. I like it because it makes her a lot more robust to my mistakes and whoopsies. It takes a while to train an aid on her, so while she learns good things a little slowly, she also learns bad things a little slowly, which is quite important when you’re doing dressage by trial and error like I am. just when you thought you had me all figured out, huh? The vast majority of horses are complicated tangles of all four defaults, as well as having splashes of random other stuff thrown in. Many are born with one default and go on to be trained to have several different ones. All of them have reacted in all four different ways at some stage in their lives, for multitudes of different reasons. As an example, Nugget is a naturally unresponsive horse who became extremely reactive (with flashes of violently resistant) and is now gradually being trained to be unresponsive again, but with bits of responsive when I ask for them. And she’s only ever had two different handlers, really. And to turn everything on its head a little, let me remind us all that people and horses are deeply similar, right at the bottom of things. We also react to the greatest Stimulus of all in different ways. Some of us fight Him. Some of us run from Him. Some of us ignore Him. And some of us hear His voice, and move forward with confidence to do as He asked. The past two months was really a journey in following this verse for me. Our minister preached about this concept somewhere in mid October, and I prayed with all my heart that Jesus would give me the strength to do exactly this. That I would do it, come Hell or high water… and that’s pretty much what happened. Olive came down with a neurological virus, possibly herpes. She was very very sick and had to be quarantined and intensively nursed. Milady then got strangles, followed by Exavior, Titan, and Destiny. Because we now had TWO outbreaks at the yard, we had to shut the whole thing down for two weeks. Yep, no lessons for two weeks. That was a financial kick in the guts. A friend kind of turned on me. Personal stuff, but it always leaks into the yard when my emotional state isn’t perfect. We had a massive hailstorm and the lightning damaged our gate, borehole pump, and power supply. I lost the ride on my beautiful Nell. What’s God’s own stableyard to do faced with such catastrophes? Well, pray and trust Him. And well… Romans 8:28. Olive recovered beautifully and not a single other horse contracted her thing. As a result, we’re tightening our vaccination program and have instituted a quarantine period for all new horses. Olive and my mom also developed an amazing bond, which is so great for the floof because she never really connected with me. My mom and dad told our yard mascot cookie lady prayer warrior awesomeness about the financial whack of losing two weeks’ lessons. She declared that we would get the money back and went straight to battle on her knees. Shortly thereafter, a client that had been owing us for months paid. Mom called to tell her that she’d overpaid a little – turned out she’d paid us by “accident”. I don’t believe in accidents. The outbreak and all its drama drew me closer and closer to God; without the strength I gained from that, I doubt there’s any way I could have coped with the personal stuff. The hailstorm brought with it the best rain we’ve had in three years. Now we’re up to our eyeballs in grass for the cows and horses. I thought Nell’s new owner was some spoilt rich kid until I spoke to her mom. She’s a special needs teenager, someone who needs a beautiful, loving horse even more than I do. Nell is going to be an instrument of God’s power in her life – just as she was in mine. Nell’s price is also letting her retired owner replace his wrecked vehicle and is helping towards his medical bills. Gutted about Nell, without a good dressage horse, my future career seemingly in tatters, I prayed: “Lord Jesus, if it’s not Your will for me to compete extensively myself, if I should conserve those resources for the kids, then please don’t let me ever have a good horse again. But if it’s Your will, please, send me one.” I prayed this ready to face the fact that I would never go up the levels: I just don’t have the money to build up the yard for everyone that needs it and own a good dressage horse, and I know which one I’m choosing. Hours later, Nell’s owner called: in return for schooling Nell, he wanted to pay me a commission. I couldn’t bear to accept money for the blessing Nell has been, so I refused it. “Okay,” he said. “Then you can come and pick out any young mare you like to train and show.” I hesitated; I didn’t know if I wanted to go through this heartache again so soon. “No, you don’t understand,” he said. “This one will be yours. In your name. You keep her.” Then I just cried, out of gratitude to him, out of awe of the dynamic and real power of God and His plan in our lives. Magic’s colic was so bad we had to box him and take him to Witbos, the vets that fixed him last time. On the way there, I desperately called on everyone I know and a bunch of people on Facebook that I don’t to pray for him. We all prayed, and when we unloaded him, that horse was fine. The rather puzzled vets scanned his healthy guts, kept him under observation for two hours, and sent him home because there was nothing wrong with him. We will praise God no matter what the storm. Because our God is faithful, our God is powerful, and our God is in charge. The condition for a miracle is difficulty. The condition for a great miracle is impossibility. And that’s exactly what we have seen. This show was perfect chaos, but by the grace of God it turned out to be one of our best shows ever. We started our preparations with a lesson with S., one of our favourite coaches ever and also our saddle fitter, at the actual show venue a week beforehand. Despite having no other horses around, Nell was ridiculously quiet and settled and we had a very productive lesson that helped us out a lot the next weekend. The general theme of the lesson appeared to be “more”: more bend, more swing, more straightness. After having chiro Nell’s walk was about a thousand times better, though. We also learned to make our halts less abrupt in order to give her a second to step up into a square halt instead of fussing around and stepping back, which was a very valuable one. The first day of the finals was the qualifying class; the top five young horses in this class would go through to the championship class the next day. I had exactly zero expectation of going to championship since we are so reliably always last, but I didn’t mind. Just being there was an honour. 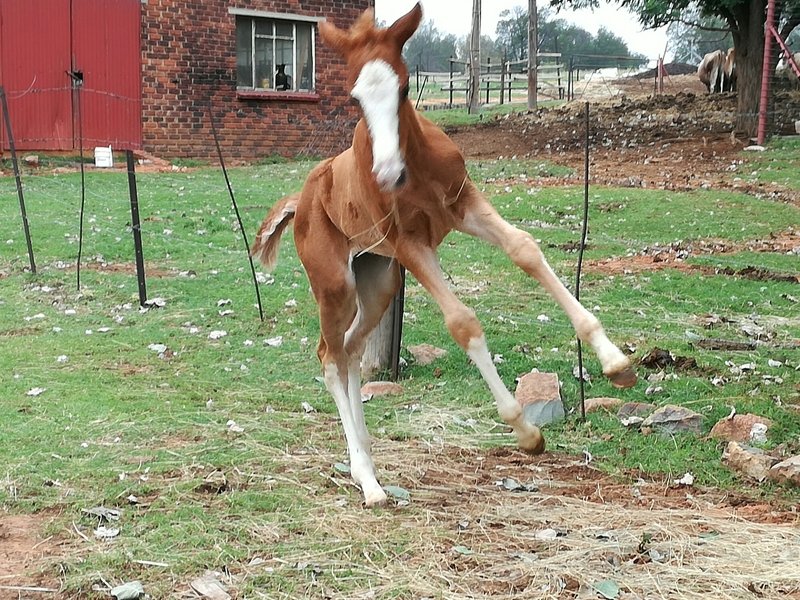 Although we arrived in a ridiculous hurry (Jacaranda Nooitie show was on the same day, and Nell had been champion mare in-hand that very morning – more on that later), Nell walked into the arena with her game face on. This on a horse that couldn’t be persuaded to get all the way to C in Prelim last year. I was desperately grateful. We had one hairy moment when my hastily buckled right rein popped off and Nell obliging turned sharply left, almost crashing into and killing Chere Burger (who went on to win basically everything in amazing style, no thanks to my rogue Friesian-squashing pony). Nevertheless, we survived this and when we walked off to introduce ourselves to the judges she was feeling pretty fantastic. This was a good thing. The chaotic morning, alongside the stress of having to get back to a yard full of kids and ponies at the Jacaranda Show, had taken its toll on me. I was trying my best and God is my peace, but I was undoubtedly not on my game. When we came down the centreline all I could think was I’ll forget the test, I’ll forget the test. Which is not ideal to be thinking in front of three top judges. I nearly did forget my test, too, getting my walk transition a few steps after C even though Nell was as obedient as they come. It was around the big long M-X-K free walk that I breathed for the first time, because Nell was being an absolute trooper. As I lengthened the reins she put down her head and swung through her back and gave a huge relaxed sigh, which was when I realised that the horse was fine. All the hours and hours we had put in had paid off: for the first time, Nell was holding my hand, instead of the other way round. The realisation was a gift from above and more valuable than any win could have been. So by the time we reached K I was grinning like a pumpkin, and when I asked for the walk-canter at C she gave it to me like a breaking wave. The canter work was just awesome. The best it’s been. When we came down the final centreline I was breathing again and could halt nicely, look up, and salute my King Jesus in gratitude. We scored 66%, a personal best at any graded show; we also scored our first seven in YDHS – for the walk! It has always been our worst mark and the improvement meant a lot to me. This was good enough for fifth place, squeaking us into the championship class the next day. Poor Nell was pretty tired and I debated going, but in the end we decided to go with the proviso that if she warmed up flat, instead of just tired, I would scratch. She was very perky in the stable that morning and warmed up pretty awesome, a little dull on my aids, but happy and relaxed. There was no resistance or unhappiness in her, so we went with it. Things went a little sideways when we walked past the judges’ box. Not expecting to get into the championship, I hadn’t familiarised myself with the rules and it was only the kind photographer that saved me from going down the centreline with a whip like a total newb. That shook me a little; I school her without a whip most of the time, but with her being quite pokey on the day, I would have liked to have had it. In the end, though, she was excellent. She was tired but she tried her guts out every step of the way and gave me every single transition so obediently, even the walk-canter. I couldn’t help but fall on her neck and squish the life out of her when we’d finished. This horse has come so far from the spooky baby I had under me last year to being a resilient adult, full of try. I knew that whatever we’d scored, I’d already won the jackpot when God dropped this incredible partner in my lap. We had 63.5%; I think we could have done better if we both had more energy. The judge complimented her attitude (everyone does), but Nell was also very on her forehand and her walk was decidedly mediocre on the day. I know our balance is a weak point, but I think she’s not nearly as bad normally. We also came last, but even from a rider’s point of view I can’t be anything but happy with it; I was on the only non-Friesian or Warmblood in the field for the entire day, and half the horses were imported, and I believe the majority of the other competitors had about ten years on me, too. It was an honour just to be riding with them. Guys, they are not kidding about this job being hard. But it’s my happy place. There have been a lot of days that I would seriously have quit coaching and training, and just kept my horses to potter on, and gone to be a writer. If I was doing this for the love of the sport, or for my enjoyment, or for money, I would have quit long ago. But my Reason for sticking with it – my Jesus – stuck with me, and here we are. Some hard times behind, and so many (so many!) hard times still ahead. But at the end of the day, when the dust has settled, I am so grateful that I’ve been given a calling that I adore. Forgive me for my sporadic updates. I’m in a happy place, but it’s a place of transition and it’s hard to keep everything afloat when things are changing. On the surface I suppose that I’m a horse rider who’s continuing to ride horses, but my world is shifting a little because something small is changing – myself. I am no longer “just a happy homeschooled Christian kid”. Happy and Christian, yes, but somehow a lot of people are treating me like an adult, and I’m not totally sure when I crossed that line. Somewhere in the past year, I went from apprentice trainer – the kid that followed the real trainer around, the glorified barn rat – to yard manager. And now people look at me like I’m a real trainer too, albeit a rather wet-behind-the-ears one. So while God’s Word is a lamp unto my feet and a light unto my path, right now the path is a little weird for me. But little as I know about adulting, I do know how to train horses, so that’s what I’ve been doing. Here’s a recap. Magic and I have been scraping back together the confidence that fell on the floor after our somewhat disastrous lesson (yeah, the one where he stopped and I fell off at a 20cm cavaletti) and we are back on (more or less) fine form. Now he’s had his horse sickness shot, commencing six weeks of boredom, but I’m so happy that we really found each other again. The chiro saw him and put all his bones back together, although she had some slightly worrying news that there are bony changes in his wither. Luckily for me (and the yard – my assistant can attest that a daily ride on Magic is essential to maintain my ability to refrain from removing people’s heads) my orders are to make sure he works in self-carriage as much and as frequently as possible. So for right now it just means that he must wear his special princess gel pad, have his saddle checked and chiro done more frequently, and work his beautiful dappled bum off. The greatest damage done is to my bank account, what’s left of it. Arwen and I are gearing up for our first full-length event since the catastrophe that was ICB, and she is feeling pretty amazing. We entered EV60 just in case, but since we have successfully jumped around EV80 and are doing 85cm confidently at home, I’m hoping that that was more cautionary a measure than necessary. The downside is that she has become ridiculously hot and fit so some of the poor riding school kiddies had some, uh, interesting expriences. Nell is feeling very good after her chiro appointment and has magically learned to stretch down. We are preparing her for the finals of YHPS, where we have to ride Novice 4. Insert sad noise here. Novice 4 is my least favourite of the Novice tests; I don’t find it very Nell-friendly. She finds most of it easy, so gets bored and decides to find something to spook at, and as for the lengthen canter – working canter transitions on a 15m circle… stuff that nightmares are made of. We survived it at Hollyberry Hall, though, so we’ll survive it at Fourways. Bruno competed for the first time in the POG and 40cm at Fourways. He’d done so many shows just as a tagalong by then that he was pretty bombproof from the word go. We had two very tiny spooks (like, slow sideways jog) and a couple of little scoots forward when we nearly got mowed down by giant youngsters, but apart from that I can’t fault him. He stood quietly in the queue, didn’t look at a single fence, and cantered around his courses with floppy ears. I love him to smithereens. He’s been one of those horses that has changed me forever and even when he sells I’ll never forget him. Lancelot is having a six-week break during his horse sickness rest period, which he needed. The chiro pronounced him sound and adorable (he’s a yard favourite), but his baby brain was cooking on the very gentle work we were doing. He does miss the attention, so I’m sure he’ll be happy again when we bring him back to work. I did have him walking and trotting in the big arena and giving a few steps of quiet canter in the ring, so we made good progress. Sookie sadly has had to go back to her owner, having done a grand total of two walk and trot tests for her competitive career. The chiro found some calcification in her lumbar vertebrae, and while these weren’t painful, I think I’d known she was done before the chiro saw her. I am not an amazing trainer but I do get my horses somewhere and Sookie and I have been stuck in a rut for months. The horse is trying her best and I am trying my best but I always had the feeling like she physically couldn’t carry out my requests. Turns out that the L2 calcification makes her back practically motionless, so she isn’t able to work through her back at all. Thankfully, it’s not a painful ailment. She’s gone home to be a broodmare, and while I know she’ll do fine, it has been a sad ending to a four-year saga that was so full of hopes and dreams when it began. She was the first warmblood I sat on, the first client horse I was supposed to compete and when you’re 15 years old (Sookie and I go further back than Magic and I) and have never had anything bigger than 14.3hh that tends to set you dreaming. Liana did her first show with her new little rider, popping through the POG and 40cm. I was extremely proud of the redhead – she has come such a long way from the anxious horse she was when she arrived. She packed her little kid around like an old hand, and the kid did great, remembering (most of) her courses and steering very well. 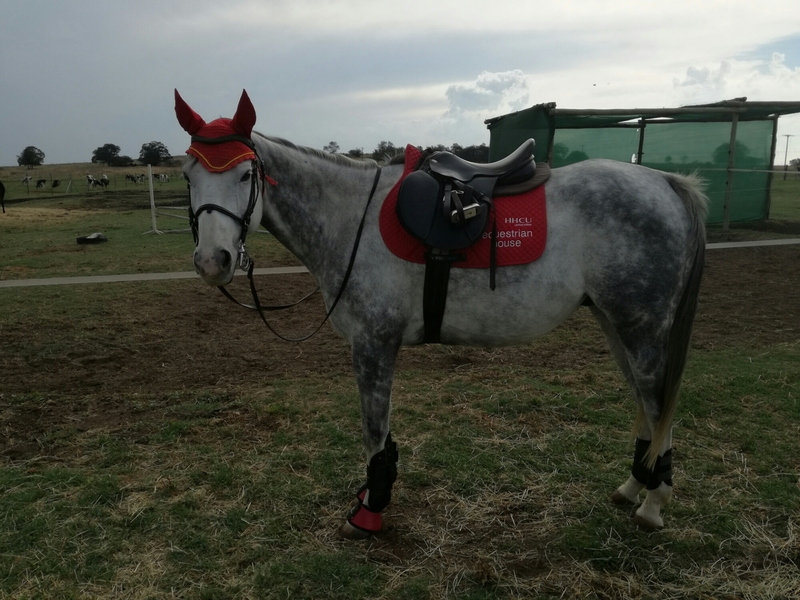 Quinni has progressed slowly but steadily, getting over some jitters during her third and fourth rides – nothing violent, I just had the feeling she wasn’t quite happy in her own skin – and is now walking fairly well around the ring. She is very obedient to all my aids, I just need her to really go forward confidently and then we’ll move on to trot. I’m excited for that because it trots like a Dutch warmblood. Olive has been awesome. She is still a bit mouthy and uncertain of the bit, but she took the long-lines without incident and the rider with even less incident. She is such a friendly floofy. Now looking for a lease home, we’ll continue her training and hopefully have walk and trot before too long. We do have walk, kind of, although she requires a lot of motivation – either lots and lots of flapping and kicking, or her favourite person standing a few feet away and calling her. All glory to the King. So April and May happened. There’s a lot to recap, so we’ll keep it short. Magic went to his second graded show; I made a whoopsie in the first class and landed feet-first in the oxer. Then I made exactly the same whoopsie in the second class and landed bum-first in the combination. Apparently one shouldn’t drop Magic at the scariest fence on course. Who knew, right? Poor old Magic was unphased, albeit somewhat confused about why Mom had so suddenly dismounted. After a lesson and a mild scolding from my coach about the fact that perfect horses must be ridden perfectly, we went to a training show in May and jumped two perfectly clear rounds without batting an eyelash. My confidence suffered only the most minor of knocks. Magic is that one horse that always has me smiling – even in this shot taken in the second class of our disastrous show. Arwen went to Nooitie Nationals and proceeded to win every class she entered. The pairs. And then, National Champion in hand. The only thing she didn’t win was the show riding, which she could have if she hadn’t had a violent head flip in the rein back. Well, we won’t be showing a rein back again… despite getting a 6.5 on the same movement in dressage. the pairs, one of her two dressage tests, and the novice show hunter. With grass in her mouth, because that’s so showing-appropriate, y’know? Then in May we went to Hollyberry Hall for the third leg of the YHPS and completed with 64%. As usual, we were dead last, but considering that the second-to-last horse had 64.1%, I won’t complain; she’s a pony with a green rider and she’s standing her ground amongst the best. Also, that’s a 4% increase from our last YHPS. I’ll take it! Exavior was turned out to pasture to await being gelded, whereupon he will be brought back into work and backed. He put on an inch to reach 16.0 hands and became more gorgeous than ever. The pregnant fairies, Cherry and Milady, continue to glow with pregnancy. Milady was briefly brought back into work when she had a client interested in her and behaved impeccably for a 6yo thoroughbred that had been out of work for half a year, but sadly it was not to be. Or not sadly. I still get a cute baby in October, so maybe we shouldn’t complain too loud. Bruno went to his first show at Nationals and took everything in his stride. He loaded, travelled, and behaved perfectly. He only did in-hand, during which he was so relaxed that the ring steward had to hit him with a clipboard to make him trot up. Later in the weekend I hacked him around an empty warmup arena and he barely bothered to waggle his giant ears. He also did a few lessons with the smaller kiddies that are just off the lead and trotting on the lunge line. Albeit having slightly erratic steering, he proved to be as safe as a house and his slow steady rhythm was perfect for the tiny tots. Lancelot had his first ride, a momentous occasion that turned out to be a non-event. He was very stuck with going forward when asked, but followed the Head Groom around with myself on his back without batting an eyelash. I was chagrined; I had expected some craziness from him, but he was as quiet as they come. Big old Sookie’s tripping improved, so we were able to move on to cantering. Her transitions were truly dreadful (ever tried flailing *and* being crooked *and* almost falling *and* crashing onto the forehand all at once?) but the canter itself is her best quality gait. We also shipped her out to Hollyberry Hall for a schooling session when we took Nell; she loaded great and travelled fairly well (a little anxious but very well behaved). At the Hall I took the precaution of lunging her – she is huge and I still don’t quite trust her not to fall on her nose if she decides to jump or spin – but it wasn’t necessary. She was looky, but sane, controllable, and totally nonviolent despite being in a big and quite spooky indoor. Good Sookie! Whisper had her photo shoot done and was snapped up in short order. Before she went, we progressed to cantering on the correct lead and then to jumping. We even took her to her first show and did ground poles. The organisation and layout was terrible, so the round didn’t go too well, but despite being severely anxious Whisper didn’t get violent once. That’s a truly safe horse right there. Finally, Liana jumped her first 70cm under me and came sixth in a massive class. In May, she also jumped her first 80cm with me and took a couple of poles but was brave to every fence. Then she did another 60 and 70cm at Nationals with her kid, snagging the National Champion Showjumper title without apparent effort. She rounded off the show by jumping her first working hunter round, where she had a spot of bother at the straw bales but did not appear at all phased by the banks. Another chaotic month at Morning Star Stables, and all our adventures for the glory of our King. This week was filled with more sunny days and bright skies and unfortunately, admin. This is the side of yard management that nobody really likes, least of all myself. Although, if I’m honest, it does give one’s legs a welcome break. This week we continued working on the little grid, making it progressively bigger and the one-strides longer and more challenging. We also added on another vertical set on a right turn from the grid on a long approach, which added an element of speed and then having to come back to a steady trot to reapproach the grid. This turned out to be a very good exercise for Magic, who was having something of a zoomy week. He was obedient through the grid even when he was feeling a little up – I guess the sudden cold snap had something to do with it – but schooling in the snaffle was a dismal failure. I had control, but that was about it. We flailed dramatically and had one enormous spook, then spooked again when I got left behind and snatched him in the mouth, ending up in a quivering heap on top of B. Poor old Arwen didn’t get as much attention as I would have liked this week. I jumped her once (which was fabulous – not a single stop over 85cm fences), gave her a lunge, took a nice hack and had a bit of flatwork schooling. At least she also had her saddle looked at. The fitter pronounced her fat and just did a little reflocking to accommodate the extra inch of roundness my 5-days-a-week, eventing, grass-only beast had accumulated. Nellie worked her rather rotund behind off. The week was fairly easy, with flatwork, hacking, and popping through the grid (she is an incredibly wiggly and untalented jumper, but has a nice hunter rhythm), but then came the dressage lesson. Our fitter also happens to be a pro dressage lady, who has soundly kicked our bottoms on baby horses at the lower levels as well as dominating in the higher ones, and has the definite bonus of being likeable, so we took the opportunity to have lessons while she was out to fit saddles. We nearly died. Just because I like dressage does not mean that it isn’t painful. We did comparatively easy stuff – a lot of transitions and trot lengthenings and some canter poles – but it was intense and we were both dying. We were sent home to do lots and lots of poles to make Nell add more “jump” to her canter and articulate her hindlegs instead of just swinging them arond. So much of hard. Also neck. Exavior wiggled himself back into my good books by loading once very well with neither assistant nor bum rope. He is such a puzzle but he can be so loveable when he quits jumping around on his hindlegs. He is, however, definitely a lot better to lead around other horses; we have to pass right by one of my pony colts on the way to the horsebox and this cheeky little colt tends to run over and squeal, but Xave ignores him flatly. The pony colt can probably fit under his belly, so I can hardly blame him. Sookie settled nicely into her new routine this week, being calm and trainable in the arena at all three gaits even with a bit of wind making things quite spooky. She had one or two really silly little looks, but much less than she used to when she was younger. We did have one awkward mishap involving an H-F trot lengthen. It started as a lengthening at H right enough, then at X we started to trip, flailed, fell on both knees, lurched dramatically upright and as a grand finale I landed bottom first upon F. The little trip just went downhill, presumably because Sookie’s muscle tone and balance are poor at this stage. She is a big horse and doesn’t have the strength to hold herself up just yet, poor soul. Needless to say we shall proceed with caution and do lots and lots of basic strengthening exercises before we approach the show circuit – I have no desire to literally fall in a heap at X. Little Bruno only did one day’s ring work, where we worked on getting solid canter for two laps of the ring each way. After that we climbed straight on and went to the big arena. We only worked in walk and trot, including walking over some ground poles without batting an eye, but he was excellent. The little guy is just a dream to handle – he learns what I teach, remembers what he’s learned, and doesn’t go in for theatrics. Lance’s SI area remains sensitive and he is consistently being lazy on the left rein, then zoomy on the right, so we are still going slow and redoing his basics to make them even more solid. He now loads like a real little champ, even out of sight of other horses, which is a challenge for him. To his utter delight, our new livery is a little yearling Arab that just wants to play. Lancey is the sweetest thing with his new buddy and he and Titan have a blast galloping around and making trouble together. He appears to have no difficulty moving in a straight line at great speeds around his paddock, at least! While I wanted to put a few steps of canter in on Whisper this week, we never really got there. Whispy has never been ridden out in a large space before – her last home had a fenced arena of about 35x15m – and my unfenced grass arena proved to be a bit of a shock to the system. To her credit, she was never wild, not for a single step. What she was, was incredibly wiggly. My groom enquired if I had been feeding her moonshine while we wobbled from one side of the track to the other, tripping over dressage letters and her own feet. By the end of the week we at least had walk and trot in fairly straight lines in the big arena, though, so soon we’ll be back on track (pun intended). Whisper isn’t the sharpest knife in the drawer, but she definitely makes up for that with abundant patience, gentleness, quietness, and memory. She’ll make a fantastic first horse for some lucky junior, with her unicorn looks to match. Stardust learned to load this week, which she did like she does everything, with a workaday, ho-hum sort of willingness. Don’t worry, Dusty, you’re not going anywhere. She also taught one of the kids to canter with great success; she’s still very sticky going onto the off lead, but on the near side, she’s very good. Baby Thunder had a jumping session with me, popping through the grid with the verticals put up to about 70cm. He had some trouble maintaining his impulsion through the two quite long one-stride lines at first, but he got it eventually. He is just such a willing guy – he’ll go between the uprights every single time, even if he demolishes the fences in the process. Although in this session with me he was very careful and didn’t touch a single pole; I think the gymnastic exercise was good for him. We rounded off the week with a successful day of outside lessons, including schooling one of my student’s super cool schoolmistress, Penny. Penny jumps whatever from wherever, although she can get a little insolent about being told what to do, having come to the reasonable conclusion that she can do it just fine herself, thank you. She remains a whole lot of fun.